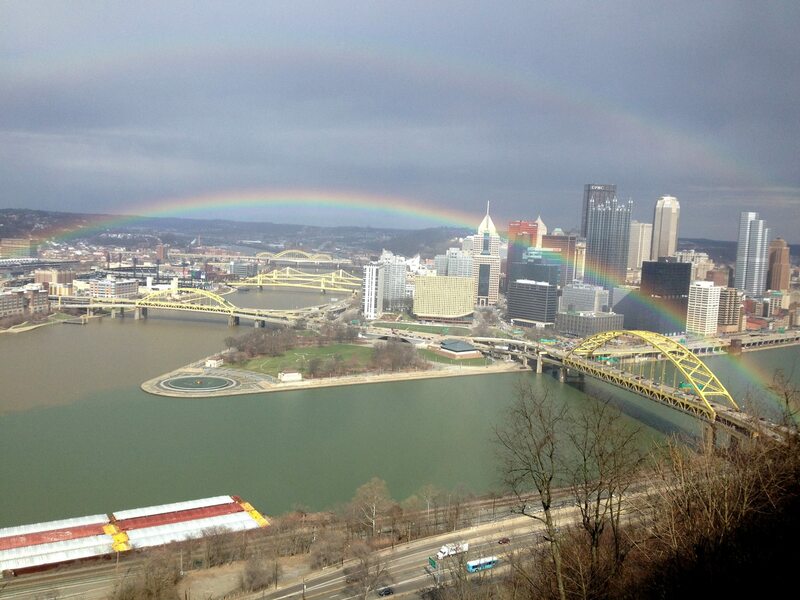 Thanks to Legends of Pittsburgh for the image of the rainbow 4/6/2015. I saw a rainbow yesterday afternoon. The soft colorful arcs are one of the few biblical symbols that I still embrace. I was taught that they were a sign of hope. In the context of the end of the 40 days and nights of rain that lifted only Noah and his ark to safety the rainbow promised that it would never happen again. It is very hard to see a rainbow and not feel promised something. Now to break it down and ask who is making the promise and how could it be delivered is to press logic onto feelings, an unsteady amalgam. I merely allow myself to feel good upon seeing one as I did yesterday. Bear in mind that I am no idle rainbow sighter. For some, encountering a rainbow is a thing of serendipity. Knowing that rainbows are a meteorological phenomena does nothing to diminish their charm for me. When there is a sun shower I dash outside and scour the horizon for a rainbow. I’d say I run about 60/40 on catching one. I also have a broad definition of a rainbow. I count those that have two imperfect or partial arcs as a double rainbow. If I can see most of the spectrum, however slightly hued, I count that as a rainbow. So it was yesterday. I was parking my car at the market, when it started raining with the sun shining brightly. I quickly put the car back in gear and headed towards the clouded part of the sky to the aptly named Grandview Avenue. 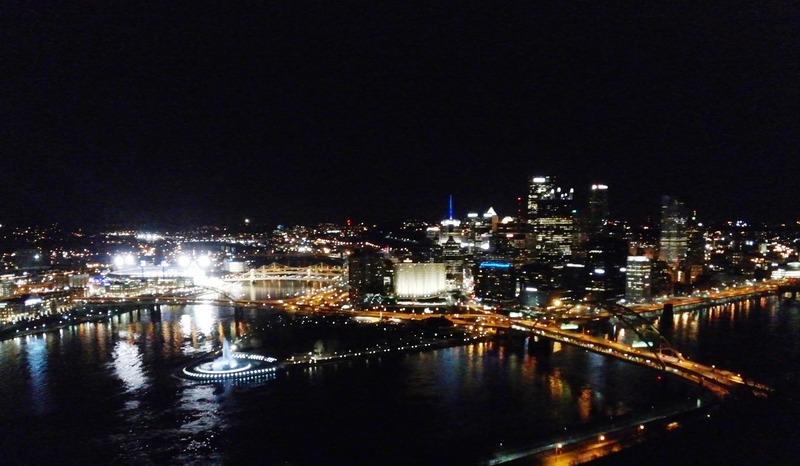 It provides a panorama of much of Pittsburgh — its three rivers, downtown and all of the ‘burgh to the north. And there it was, a sweet, barely nascent, but wide, crescent of colors. It grew into a more tangible rainbow, if there could be such a thing, and slowly a second one bloomed above the first. I’ve written elsewhere of the challenges this move has provided me, and when I watched those colors arise out of drops of water and sunshine I felt reassured about everything. It was nearly 70 degrees, something that seemed distant and unlikely only a week ago The city glimmered beneath its partial corona, damp, warm and welcoming. I was basking in the vision with a clutch of tourists and youngsters still on vacation. In those few minutes all of us with our disparate expectations and world views became a community through science in action. It was lovely.